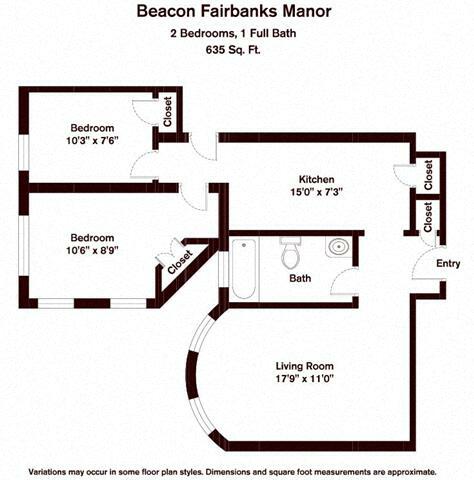 Beacon Fairbanks Manor has just the apartment for rent in Brookline you’ve been looking for! Each of these studios, one-, and two-bedroom apartments for rent in Brookline has original hardwood flooring and classic period details that have been brought up to date with energy-efficient appliances and water saving toilets and faucets. You can make your apartment rental payment online, and you won’t have to pay extra for heat and hot water for your Brookline MA apartment. These Brookline MA apartments are backed by our 24 hour maintenance response guarantee. The apartment building sits on a beautifully tree lined street that’s within walking distance of shops and restaurants and public transportation. The Green C and D lines, Coolidge Corner, and Longwood Medical Area are all within striking distance of these tasteful apartments. Beacon Fairbanks Manor apartments for rent in Brookline, MA, are uniquely situated in a suburban environment with an urban twist, just steps from the MBTA Green Line. The apartment building is surrounded by tree-lined streets near a host of major retail centers, including the Atrium Mall, Brookline Village, the Chestnut Hill Shopping Center, Cleveland Circle, Coolidge Corner, Washington Square, and more. Besides boasting a wealth of nearby upscale shops, boutiques, and health clubs, Beacon Fairbanks Manor apartments for rent are also within walking distance of a variety of restaurants and gorgeous parks. The city of Brookline has a longstanding reputation for exemplary public education and residential neighborhoods. Additionally, Coolidge Corner and the Longwood Medical Area are in close proximity to Beacon Fairbanks Manor apartments. In a city with such easy access to cultural, educational, and wellness institutions, living within the Greater Boston area is merely an added bonus for our apartment rentals. WalkScore, an independent national survey that rates walkability in regards to a property’s convenience and access to local amenities, rated Beacon Fairbanks Manor 82 out of 100. The Beacon Fairbanks Manor apartments are conveniently located near public transportation – the Green C and D lines via the T stop on Beacon Street are right across the street. In addition, Brookline residents enjoy an easy commute to Boston businesses, hospitals, and universities. The cultural allure of Boston is but a bus, train, or car ride away traveling along Beacon Street, Route 9 or the Mass Pike. Beacon Fairbanks Manor offers studio, one, and two-bedroom renovated apartments for rent in Brookline, all of which offer exceptional service and convenience. Each apartment home comes with free heat and hot water. Forget about writing checks – Beacon Fairbanks Manor apartments offer the option to pay your rent online. A 24-hour maintenance response guarantee means never having to worry about emergencies. 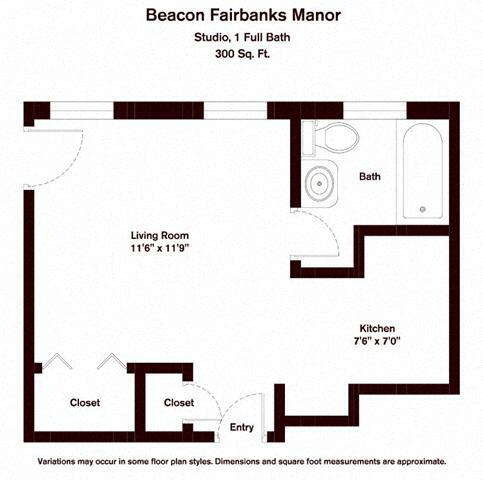 Living in a Beacon Fairbanks Manor apartment home is an exercise in ease and convenience. My husband and I have lived here for 4 years now. We have consistently received excellent service, especially from the maintenance department. They respond quickly and take care of any issue that comes their way. I can't say enough about them. The office staff are warm and friendly and let you know that they value you. I know most of them by first name. You don't find that with most companies anymore.